All transactions are safe and secure with a reliable history in online purchasing behind each of our associates. Buy the Grinch Costume Shirt or Hoodie t-shirt to own Dr. Seuss clothing and merchandise. You're a mean one, Mr. Grinch. You really are a heel. You're as cuddly as a cactus. You're as charming as an eel, Mr. Grinch. You're a bad banana with a greasy black peel. If you have all the tender sweetness of a seasick crocodile or if the lovability of little Cindy Lou Who doesn't melt your heart, then these products might be for you. This design features the wide evil grin of the Grinch and is available as a shirt or hoodie. Whether it is a happy smile or a wicked smile, this Dr. Seuss costume t-shirt for adults will definitely get a grin. Choose the hoodie for extra comfort and warmth. 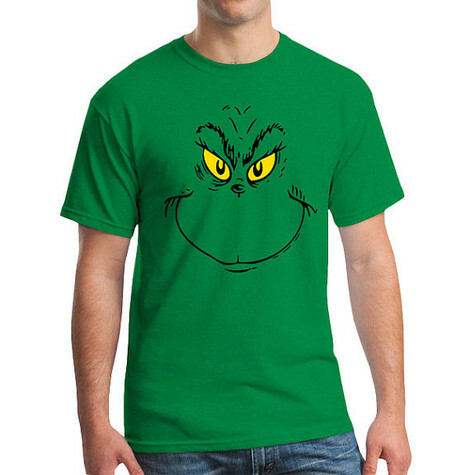 In addition to the Grinch Costume Shirt or Hoodie tee above, browse the Dr. Seuss Clothing Gallery for more apparel like men's and women's clothes, kids shirts or hoodies.